Download "Ch. 38 Practice MC 1. In international financial transactions, what are the only two things that individuals and firms can exchange? A." 1 Ch. 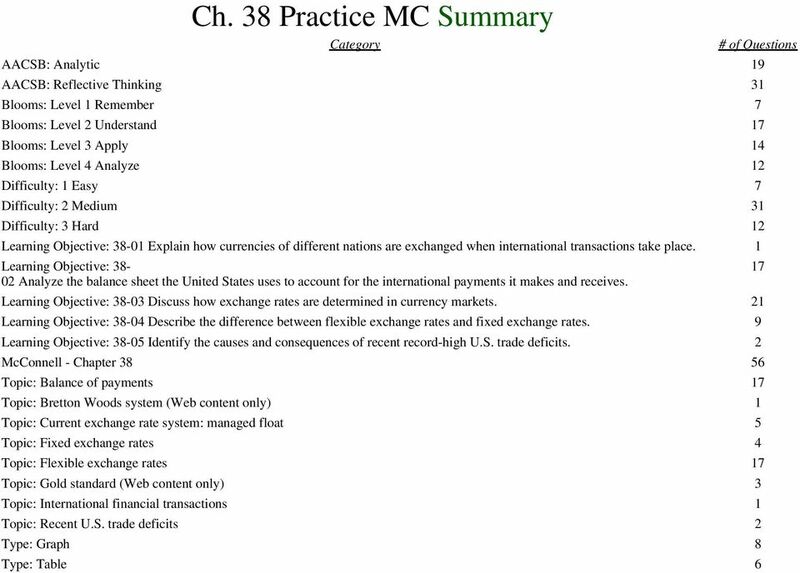 38 Practice MC 1. In international financial transactions, what are the only two things that individuals and firms can exchange? A. Currency and real assets. B. Services and manufactured goods. C. Preexisting assets and currently produced goods and services. D. Currency and currently produced goods and services. 2. If a nation has a current account deficit and it does not have to make any inpayments or outpayments of official reserves, it must have a: A. surplus in its capital and financial account. B. balance of payments deficit. C. balance of payments surplus. D. deficit in its capital and financial account. 3. In the U.S. balance of payments, foreign purchases of assets in the United States are a: A. foreign currency outflow. B. foreign currency inflow. C. current account item. D. debit, or outpayment. 4. Which of the following combinations is plausible, as it relates to a nation's balance of payments? A. Current account = $ + 40 billion; capital account = $ - 10 billion; financial account = $ - 50 billion. B. Current account = $ + 50 billion; capital account = $ - 20 billion; financial account = $ + 30 billion. C. Current account = $ + 10 billion; capital account = $ + 40 billion; financial account = $ + 50 billion. D. Current account = $ + 30 billion; capital account = $ - 20 billion; financial account = $ - 10 billion. 5. There must always be a balance of a nation's: A. goods exports and gold imports. B. total international payments. C. imports and exports of goods and services. D. net transfers and net investment income. 6. If a nation's goods exports are $55 billion, while its goods imports are $50 billion, we can conclude with certainty that this nation has a: A. balance of trade (goods) surplus. B. balance of payments surplus. C. positive balance on current account. D. positive balance on goods and services. 7. It may be misleading to label a trade deficit as unfavorable or adverse because: A. the multiplier does not apply to a trade deficit. B. a trade deficit increases a nation's aggregate output and employment. C. a nation's consumers benefit from a trade deficit during the period it occurs. D. a trade deficit precludes inflation. 8. A deficit on the current account: A. normally causes a surplus on the capital and financial account. B. normally causes a deficit on the capital and financial account. C. has no relationship to the capital and financial account. D. means that a nation is making international transfers. 2 Answer the question on the basis of the following 2010 balance of payments data (+ and hypothetical nation of Zabella. All figures are in billions of dollars. ) for the 9. Refer to the above data. Zabella has a balance of trade (goods): A. deficit of $10 billion. B. surplus of $5 billion. C. surplus of $10 billion. D. deficit of $5 billion. 10. Refer to the above data. Zabella's balance on goods and services shows a: A. $5 billion deficit. B. $5 billion surplus. C. $10 billion surplus. D. $15 billion deficit. 11. Refer to the above data. Zabella's balance on financial account shows a: A. deficit of $10 billion. B. surplus of $5 billion. C. deficit of $28 billion. D. surplus of $13 billion. 12. Refer to the above data. Zabella's balance on capital and financial account shows a: A. deficit of $5 billion. B. surplus of $10 billion. C. deficit of $10 billion. D. surplus of $5 billion. The plus items below are "export-type" entries and the minus items are "import-type" entries in the balance of payments for the hypothetical country of Zippo. 13. Refer to the above information. The financial account items for Zippo are: A. 1, 2, 3, and 4. B. 1, 3, 4, 5, 7, and 9. C. 6 and 8. D. 1, 2, 4, 7, and In the balance of payments of the United States, U.S. goods imports are recorded as a: A. positive entry. B. capital account entry. C. current account entry. D. financial account entry. 4 22. Refer to the above diagram. At the price $.80 for 1 euro: A. the quantity of euros demanded equals the quantity supplied. B. the dollar-euro exchange rate is unstable. C. the dollar price of 1 euro equals the euro price of 1 dollar. D. there will be a surplus of euros in the foreign exchange market. 23. Refer to the above diagram. Other things equal, a leftward shift of the supply curve would: A. appreciate the euro. B. cause a shortage of euros. C. increase the equilibrium quantity of euros. D. appreciate the dollar. 24. Refer to the above diagram. The initial demand for and supply of pesos are shown by D 1 and S 1. The exchange rate will be: A. M dollars for one peso. B. B pesos for one dollar. C. A dollars for one peso. D. C dollars for one peso. 25. Refer to the above diagram. The initial demand for and supply of pesos are shown by D 1 and S 1. Suppose the United States reduces its imports of Mexican goods, shifting its demand for pesos from D 1 to D 2. If the United States was operating under a system of exchange controls, the U.S. government would: A. find that, at the controlled exchange rate, pesos would be in surplus. B. be faced with deteriorating terms of trade. C. be faced with the problem of rationing BG pesos to U.S. importers who want BF pesos. D. be faced with the problem of rationing BF pesos to U.S. importers who want BG pesos. 26. Refer to the above diagram. The initial demand for and supply of pesos are shown by D 1 and S 1. Suppose the United States reduces its imports of Mexican goods, shifting its demand for pesos from D 1 to D 2. If the United States and Mexico were both on the international gold standard: A. gold would flow from Mexico to the United States. B. the exchange rate would rise from B dollars equals 1 peso to C dollars equals 1 peso. C. gold would flow from the United States to Mexico. D. the exchange rate would fall from B dollars equals 1 peso to A dollars equals 1 peso. 27. Refer to the above diagram. The initial demand for and supply of pesos are shown by D 1 and S 1. Suppose the United States reduces its imports of Mexican goods, shifting its demand for pesos from D 1 to D 2. Under a system of freely floating exchange rates: A. gold would flow from Mexico to the United States. B. the peso price of dollars would rise from B pesos equals $1 to A pesos equals $1. C. a problem of rationing a shortage of pesos would arise in the United States. D. the dollar price of pesos would increase to C dollars equals 1 peso. 5 28. Under a system of freely flexible (floating) exchange, rates a U.S. trade deficit with Mexico will tend to cause: A. the United States government to ration pesos to U.S. importers. B. a flow of gold from the United States to Mexico. C. an increase in the peso price of dollars. D. an increase in the dollar price of pesos. 29. If in a system of fixed exchange rates the dollar price of euros is above the market equilibrium level: A. gold will flow from the United States to Europe. B. there will be a surplus of euros. C. the United States government will have to ration euros to U.S. importers. D. there will be a shortage of euros. Answer the question on the basis of the following table which indicates the dollar price of libras, the currency used in the hypothetical nation of Libra. Assume that a system of freely floating exchange rates is in place. 30. Refer to the above table. The equilibrium dollar price of libras is: A. $5. B. $4. C. $3. D. $ According to the purchasing power parity theory of exchange rates: A a dollar, when converted to other currencies at the prevailing floating exchange rate, has the same. purchasing power in various countries. B. in equilibrium, national currencies have equal value in terms of gold. C the higher a nation's price level in terms of its own currency, the greater is the amount of foreign. exchange it can obtain for a unit of its currency. D. nominal currency values will tend to equalize (become 1 = 1) in the long run. 32. The idea that freely floating exchange rates equate the buying power of national currencies is called: A. the equation of exchange. B. the balance of payments. C. Say's Law. D. the purchasing power parity theory. 33. Assume that Japan and South Korea have flexible exchange rates. Other things equal, if economic growth is more rapid in Japan than in South Korea: A. gold bullion will flow out of Japan. B. the Japanese yen will depreciate. C. the South Korean won will depreciate. D. the yen and won exchange rate will stay constant. 6 34. Refer to the above diagram where D and S are the United States' demand for and supply of Swiss francs. At the equilibrium exchange rate, E, the United States' balance of payments is in equilibrium. A shift of the demand curve to D' might be the result of: A. a relative decline in interest rates in Switzerland. B. a reduction in the United States' relative price level. C. a recession in the United States which slows its rate of growth. D. a relative decline in interest rates in the United States. 35. Refer to the above diagram where D and S are the United States' demand for and supply of Swiss francs. At the equilibrium exchange rate, E, the United States' balance of payments is in equilibrium. Under a system of fixed exchange rates, the shift in demand from D to D' will cause: A. the United States to increase its stocks of international monetary reserves. B. a Swiss balance of payments deficit. C. a U.S. balance of payments deficit. D. a U.S. balance of payments surplus. 36. If the United States has full employment and the dollar dramatically depreciates in value, we can expect (other things equal): A. both U.S. imports and U.S. exports to rise. B. both U.S. imports and U.S. exports to fall. C. U.S. exports to fall and U.S. imports to increase. D. inflation to occur. 37. Suppose interest rates fall sharply in the United States but are unchanged in Great Britain. Other things equal, under a system of freely floating exchange rates we can expect the demand for pounds in the United States to: A. decrease, the supply of pounds to increase, and the dollar to appreciate relative to the pound. B. increase, the supply of pounds to increase, and the dollar may either appreciate or depreciate relative to the pound. C. increase, the supply of pounds to decrease, and the dollar to depreciate relative to the pound. D. decrease, the supply of pounds to increase, and the dollar to depreciate relative to the pound. 38. Assume that, under a system of floating exchange rates, Mexicans decide to increase their investments in the United States. As a result: A. the peso and the dollar will both depreciate. B. the peso and the dollar will both appreciate. C. the peso will depreciate and the dollar will appreciate. D. the peso will appreciate and the dollar will depreciate. 39. In saying that the present system of floating exchange rates is managed we mean that: A. countries that allow their exchange rate to move freely will lose their borrowing privileges with the IMF. B. the value of any IMF member's currency can only vary 2 percent from its par value. C. IMF officials determine exchange rates on a day-to-day basis. D.the central banks of various countries sometimes buy and sell foreign exchange to alter undesirable trends in exchange rates. 7 40. The exchange rate system currently used by the industrially advanced nations is: A. the gold standard. B. the Bretton Woods system. C. the managed float. D. a fixed rate system. 41. Under the managed floating system of exchange rates: A. all exchange rates vary with changes in the free-market prices of gold. B. industrialized nations meet once each year to negotiate readjustments in their exchange rates. C. exchange rates are essentially flexible, but governments intervene to offset disorderly fluctuations in rates. D. exchange rates are adjusted at the discretion of the IMF. 42. Which one of the following is not one of the so-called G8 nations? A. Japan B. Canada C. United States D. China 43. Suppose the G8 nations decide that the dollar is too strong (high in value) relative to the yen. These nations might: A. use official reserves of yen to buy dollars. B. use official reserves of dollars to buy yen. C. encourage Japan to print more yen. D. encourage the United States to increase interest rates. 44. Two of the implications of large U.S. trade deficits for the United States are: A. decreased current consumption and decreased indebtedness to foreigners. B. reduced budget deficits and decreased indebtedness to foreigners. C. reduced current consumption and higher saving. D. increased current consumption and increased indebtedness to foreigners. 45. In terms of individual nations, the largest U.S. trade deficit is with: A. Japan. B. Mexico. C. China. D. Canada. 46. (Last Word) Currency speculators aid international trade by: A. absorbing exchange rate risk that others do not want to bear. B. increasing the volatility of exchange rates. C. making the demand for imports less elastic. D. promoting barter. 47. Which of the following is not a condition of the international gold standard? A. A nation must be willing to accept very wide fluctuations in its exchange rate. B. A nation must allow gold to be freely exported and imported. C. A nation must be willing to convert gold into paper money and vice versa at a stipulated rate. D. A nation must define its monetary unit in terms of a certain quantity of gold. 48. Under an international gold standard: A. a nation's exchange rate is virtually fixed. B. domestic output and the price level will fall in those nations receiving international gold flows. C. a nation's balance of payments surplus will be corrected by an outflow of gold. D. a nation's balance of payments deficit will be corrected by an inflow of gold. 8 49. Under a gold standard a balance of payments disequilibrium would be corrected automatically by: A. the depreciation of that country's currency. B. an increase in the gold content of that nation's monetary unit. C. the appreciation of that country's currency. D. an outflow or inflow of gold. 50. The Bretton Woods system of exchange rates relied on: A. freely floating exchange rates. B. fixed exchange rates with no mechanism for changing them. C. fixed or pegged exchange rates, with occasional orderly adjustments to the rates. D. the United States to set and periodically review worldwide exchange rates. Exchange Rates and the International Money Markets Exchange Rates and the International Money Market Copy down these definitions: Net exports (Xn)- the value of a nations total exports(x) minus imports(m). 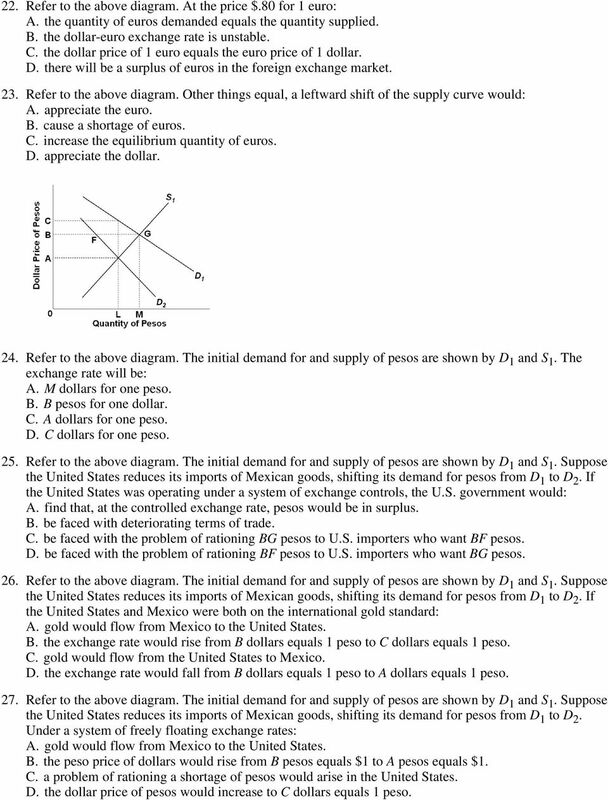 Chapter 7 The Asset Market, Money, and Prices Multiple Choice Questions 1. A disadvantage of the barter system is that (a) no trade occurs. (b) people must produce all their own food, clothing, and shelter. University of Lethbridge Department of Economics ECON 1012 Introduction to Macroeconomics Instructor: Michael G. Lanyi CH 24 Money Price Inflation 1) Money is A) currency plus coins. B) the same as gold.